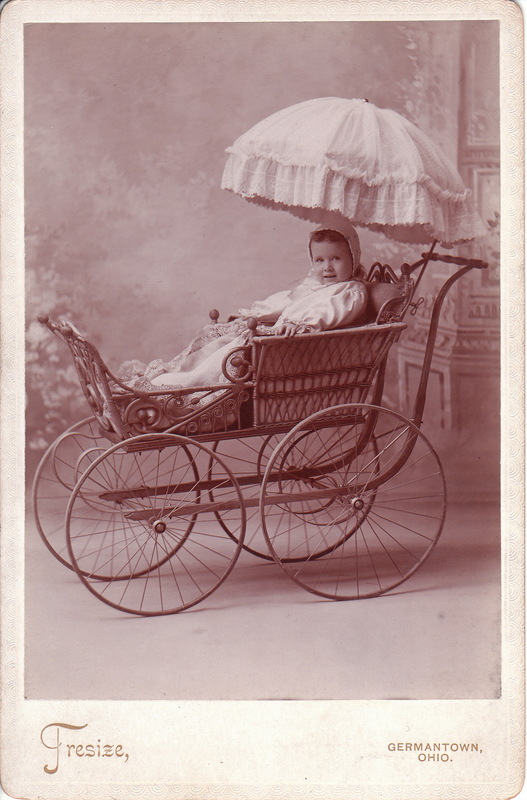 This cabinet card photograph captures baby sitting comfortably in a luxury baby carriage. There will be no discomfort from the sun for this cute baby; courtesy of the large umbrella built into this Rolls Royce of baby prams. The photographer is Tresize,of Germantown, Ohio. Research reveals that Ohio had a number of photographers named Tresize, and it is unknown which Tresize is responsible for this image? Dayton, Ohio was the home of The Tresize Brothers Studio as well as photographer S. P. Tresize. Samuel P. Tresize was a photographer located in Logan, Ohio. J.Q. A. Tresize was a photographer in Zanesville, Ohio and a partner in the Photography Studio named Jaquary and Tresize. William C.Tresize was a photographer in McConnelsville, Ohio. Suffice it to say, it is unknown which Tresize photographed this image. To see other photographs of baby carriages, click on this site’s category “Baby Carriages”.